Hop aboard Grapevine’s Vintage Railroad and have a unique experience riding the rails along the historic Cotton Belt Route between Downtown Grapevine and the Fort Worth Stockyards. Riders will enjoy the ride in authentic Victorian-style coaches that will take you back in time to the early 1900′s. 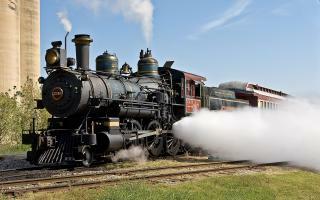 Two vintage locomotives pull the rail cars – “Puffy” the 1896 steam locomotive and a 1953 GP-7 diesel locomotive.